3577 km raced at an average speed of 31.36 km/hr. 102 starters and 62 classified finishers. This was the first Giro with half stages, that is, two stages held the same day. No time bonuses were awarded this Giro. The winner, Vasco Bergamaschi, had been brought to the Giro to ride as a gregario for Costante Girardengo. This was Gino Bartali's debut Giro. His first stage win was the seventh stage, where he won alone. Bergamaschi did well enough that stage to become the General Classification leader. He held that lead all the way to Milan. Attilio Masarati @ 3min 2sec. The twenty-third Giro had, depending on how you count, eighteen or twenty stages. For the first time the Giro had “half-stages”. That’s right, two races in a single day. The organizers stuffed a road stage into the same day as each of the two time trials. For now, time bonuses for stage wins were discontinued. The quality of the Giro peloton kept improving. The Italian contingent had Guerra, Binda, Di Paco, Bertoni, Piemontesi, Girardengo (42 years old), Marchisio, Pesenti, Camusso and three other riders unmentioned so far in this story. Giuseppe Martano had been enjoying a sparkling career since he turned pro in 1932, with a second and third place in the Tour already under his belt. Vasco Bergamaschi had been brought to the Tour to ride as a gregario for Guerra. Out of four Grand Tour starts so far, he had been able to finish only once. There was also a young rider who had just turned pro the year before, a 21-year-old Tuscan named Gino Bartali. More about him later. The French sent a powerful contingent. Arriving to ride their first Giro were André Leducq, winner of the 1930 and 1932 Tours de France, though perhaps a bit past his best years, and Maurice Archambaud, part of the French national team that had won five consecutive Tours. Archambaud was nicknamed “Chubby Cheeks” by Desgrange and “The Dwarf” by others. This short, powerful man was one of the finest riders in an age teeming with talent. We’ve already noted that he was the first winner of the Grand Prix des Nations. René Vietto and Demuysère filled out the roster of quality riders from the north. The first stage shot southeast across the Lombardy Plain for a big sprint finish in Cremona. The winner there was Guerra’s new helper, Bergamaschi. The next day Piemontesi managed to get four seconds clear in Mantua, where he took the lead. So far, Guerra, the man whose name was on the tip of every tongue, had been buried in the pack. 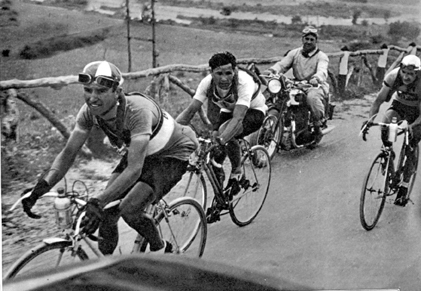 On stage three, Guerra was the day’s winner, just in front of Olmo, who had beaten him that spring at Milan–San Remo. Guerra won stage four as well but Piemontesi’s hopes were crushed after he lost nearly nine minutes. A second-year pro named Walter Fantini found himself the shock owner of the maglia rosa. The dream of finishing another Giro was over for Girardengo who retired after stage four. Young Fantini’s ownership of the lead couldn’t last. At Cesenatico, in Emilia-Romagna, Giuseppe Olmo surprised the experts by winning the 35-kilometer time trial, distancing Guerra by 84 seconds and Bergamaschi by almost two minutes. The Human Locomotive had not brought his 1934 Giro form to the 1935 race. Olmo now had a 34-second lead in the Overall ahead of Bergamaschi. He kept it until the historic seventh stage at L’Aquila in the mountainous region of Abruzzo. 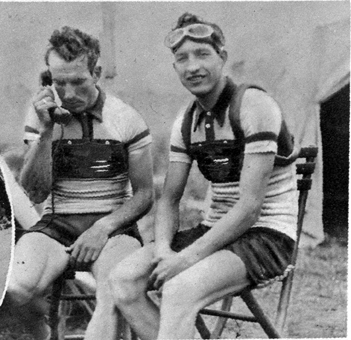 Giuseppe Martano and Gino Bartali after a stage ended. Guerra won three of the next four stages. But as in the year before, he wasn’t able do his own cause much good because his rivals were always right on his wheel. He couldn’t distance himself from his competitors in the hills and despite his prowess in riding against the clock, big breakaways were either not his style or simply beyond him. His powerful sprint served him well, but it was no way to gain time, especially in an edition with no time bonuses. Owning the leadership of a Grand Tour does things to a man. The maglia rosa stiffens the spine and strengthens the legs. Lesser men who find themselves wearing pink often rise to the occasion and ride like great champions. Vasco Bergamaschi was no exception. The twelfth stage took the race over the Tuscan hills, from Rome into Florence. The peloton was still largely together with about 100 kilometers to go. Bartali was first to the top in Radicofani, a hill town south of Siena. Next came a group of six who’d broken away, including Bergamaschi, Archambaud and Martano. They caught young Bartali, with Bergamaschi winning the stage while the other great aces needed another five and a half minutes to finish. The fifteenth stage was a 43-kilometer time trial between Lucca and Viareggio, and a real threat to Bergamaschi’s hegemony. Archambaud took the day’s prize with Olmo second at 65 seconds and Guerra third, 96 seconds down. Bergamaschi had to concede 2 minutes 2 seconds to Archambaud, but Archambaud—a stocky rider prone to crashing—wasn’t really a Classification threat. The real danger was Martano and he’d only dinged him for six seconds. Bergamaschi’s ownership of the Pink Jersey was safe for now. Cecchi lost enough time to drop to third place. The penultimate stage had the Sestriere pass in the way, and as had happened before in this Giro, Bartali was first to the top. After Bergamaschi took the lead for good in the sixth stage he never seemed to be under any real threat of losing it. It was a superb performance by a man who would never again rise to such heights. The Italian press called him “Il Singapore” because of they thought his face had an Asian aspect. 5. Maurice Archambaud (Dei) @ 9 minutes 19 seconds. André Leducq abandoned after having made it only to Florence, the twelfth stage. From here the storied rider would earn only two more professional wins before retiring. This was 33-year old Alfredo Binda’s last Giro. In addition to his five Giro wins he had also won 41 stages, a record that stood from 1933 until 2003 when Mario Cipollini won his 42nd Giro stage. In addition, he was World Road Champion three times, won Milan–San Remo and the Tour of Lombardy each four times. Beyond being one of cycling’s greatest-ever riders and a talented musician, legend has it that Binda designed the famous Legnano logo of the sword-wielding knight Alberto da Giussano, who defeated Barbarossa at the battle of Legnano. Binda would retire from racing in 1936 after crashing and breaking his femur in Milan–San Remo. That fall Olmo would break the world hour record, bringing it to 45.090 kilometers, which Archambaud would break in 1937. This was a class peloton.